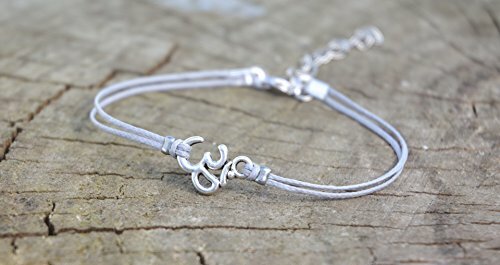 Om anklet - cord anklet with a Tibetan silver Om charm - ॐ (The Om id a Hindu Symbol of the Absolute). The color of the cord is gray and it is made of waxed cotton. The Om charm is Tibetan silver. The anklet come with an extension so it is adjustable. You can request a thread in a different color from the colors shown in the last picture. The anklet is 8 1/2" (21.5cm) long plus a 1 1/2" (4cm) extension. If you would like a different length, please choose your option at checkout. This anklet is minimalist and combines antique design, soft touch, and casual materials blending into an elegant simplicity. This ankle bracelet is great as a gift for a woman or a girl. All of our anklets comes wrapped and ready for gift giving! If you have any questions about this product by Shani & Adi Jewelry, contact us by completing and submitting the form below. If you are looking for a specif part number, please include it with your message.